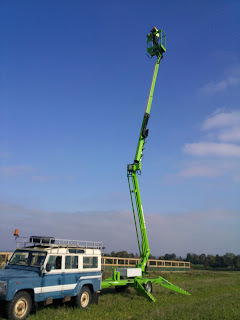 Yesterday at Chilbolton, we made use of the trailer-mounted cherry picker. The first image was made from a height of approx. 10 metres above the hard compound at the end of the HBA array. It gives a great view of the HBA, but the LBA is still visible in the distance. The second image is from the opposite right side, looking back over the LBA, but also with an excellent view of the HBA and 25m dish in the background. It was made from a height of approx. 16 metres. The final image shows the photographer in action; not a job for anyone with a fear of heights. 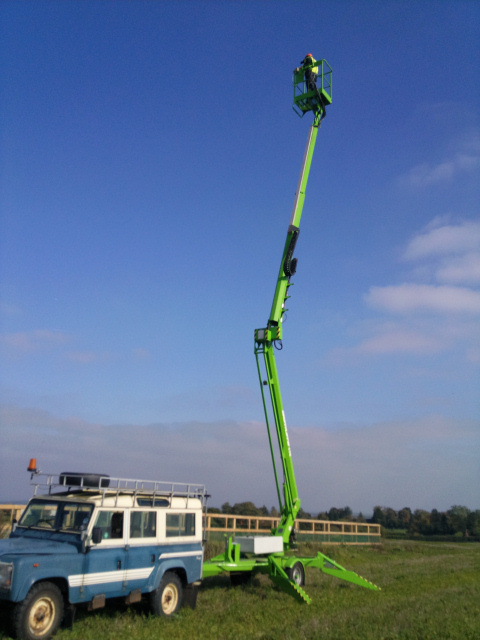 Also thanks are due to Mal Clarke from the Chilbolton Observatory who had the original idea to use the cherry picker to take pictures and also lent LOFAR-UK his camera so we could get higher resolution images.